The Woodsman Ghillie Suit is our Ultra-Light Jacket and Pants with a few upgrades! 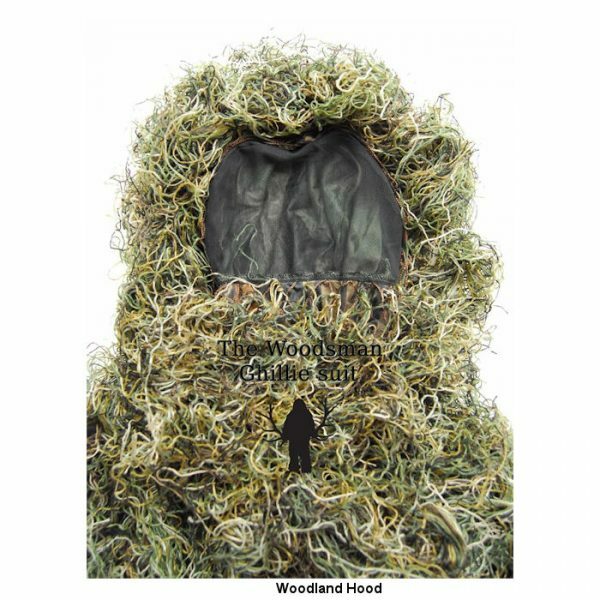 There is now removeable mosquito netting for the hood to keep out those annoying insects.This is attached with a zipper and can be easily removed. Additionally, both the Jacket and the Pants now have zippered pockets! There are many advantages to choosing a synthetic Ultra-Light suit. Weight (Medium = 5 lbs. There are so many jacket and pants sets to choose from and more being continually introduced into the market. 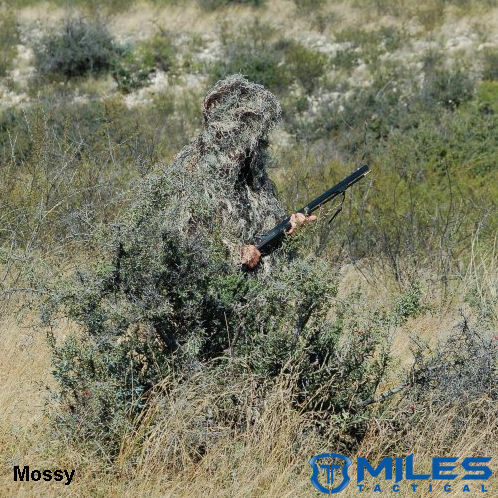 This suit has remained the ghillie set of choice because of the customizable construction and durability. 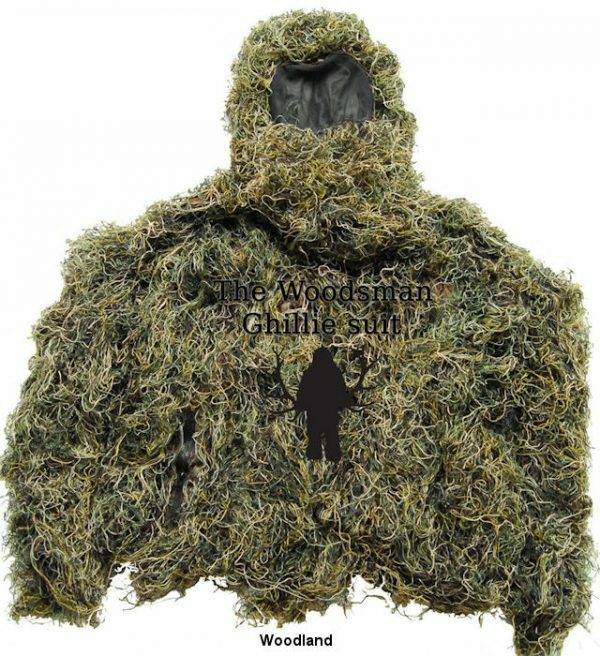 This is a 2 piece ghillie suit and has a hood built onto the jacket. The suit has a 3 layer construction; Base layer, netting and ghillie thread. The base layer is a fine, comfortable bug proof mesh. On top of the mesh is sewn our tough 1″ by 1″ netting and on the netting we have tied the Ultra-Light Jute string. The second layer of netting allows for endless on-field customization due to changing seasons and application environments. The cuffs on the jacket and pants each have cord-locks sewn in to keep the bugs out. The Jacket has a draw cord on the attached hood, and a draw cord at the waist. The Jacket has a zipper with a flap that covers the zipper. Velcro is sewn in to secure the flap and cover the zipper. Both the Jacket and Pants have zippered pockets. Keep your hunting or paintball supplies secure! The hood now has removeable bug netting. Attaches with a zipper and is easily removed. The Pants have Elastic sewn into the waist for added comfort, and if you prefer to wear a belt, we have included Belt Loops! 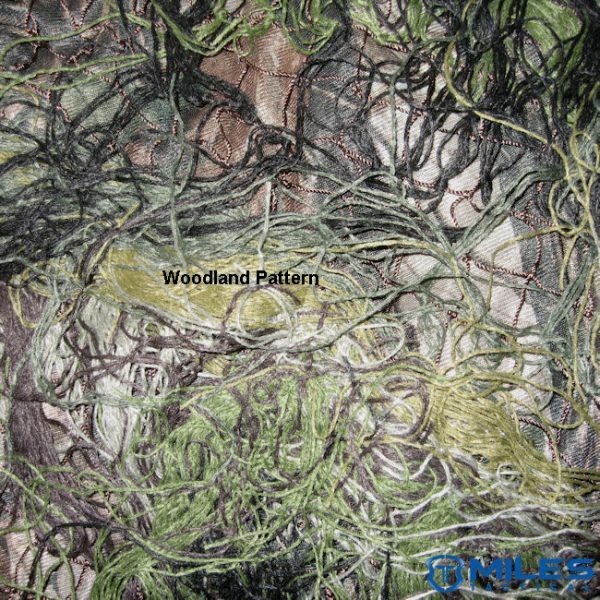 There are 2 pattern choices of Woodland or Mossy. The woodland is quite dark with black, brown, dark green and tan colors. This is great for areas that are very green and dark. 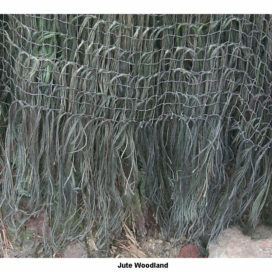 The mossy is light with brown, tan, and light green colors. 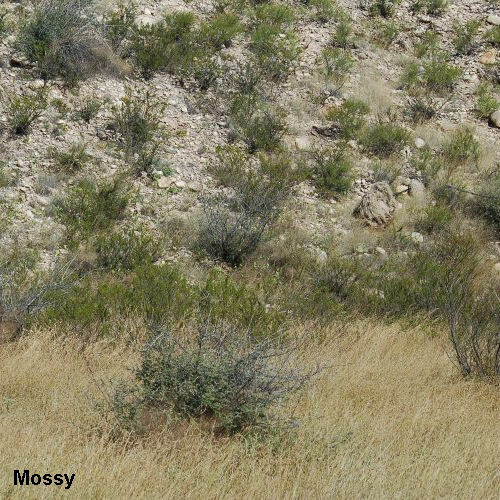 The mossy is very well suited for desert environments. 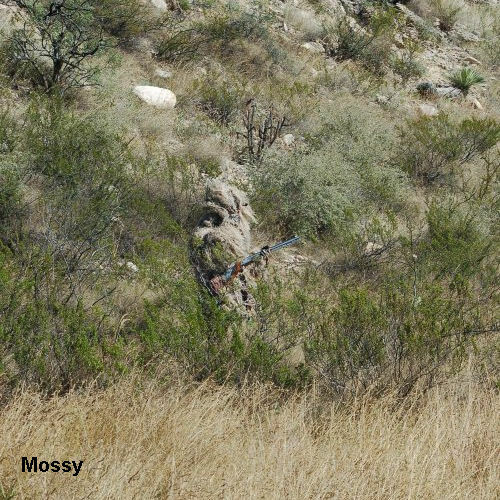 The pictures above depict the mossy pattern in the woods and in a desert type environment. 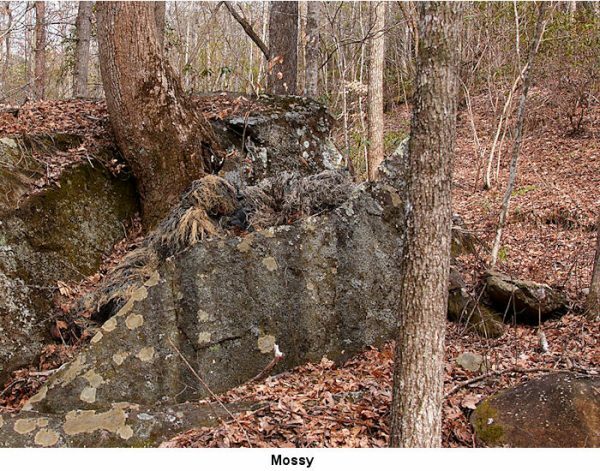 The mossy can fit in a forest environment very well if the undergrowth is dry. Choose the pattern that is closest to where you will be using it and you can then customize the pattern to your local area. 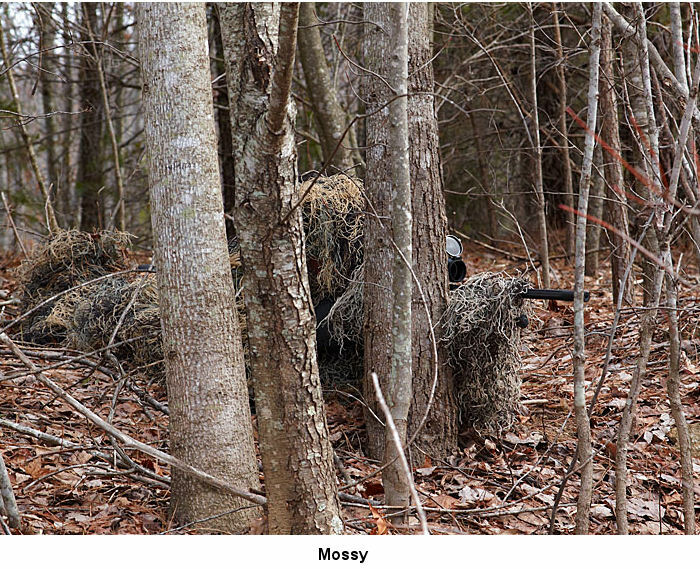 A tip from our snipers is to use camo paint for pattern changes. Another nice feature of this suit is the 3 size options of Medium, Large and X-Large. 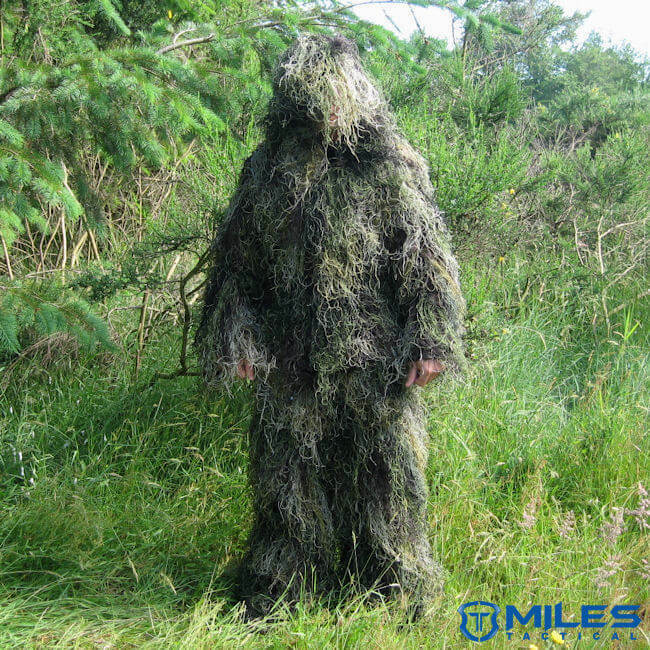 You don’t want your ghillie suit set to be too baggy, and more sizing options help eliminate that. The sizing on this suit goes by waist size. Give yourself some room for extra clothing underneath. For example, f you wear size 32″ pants, you should choose the medium size. A 36″ waist should choose the large size. 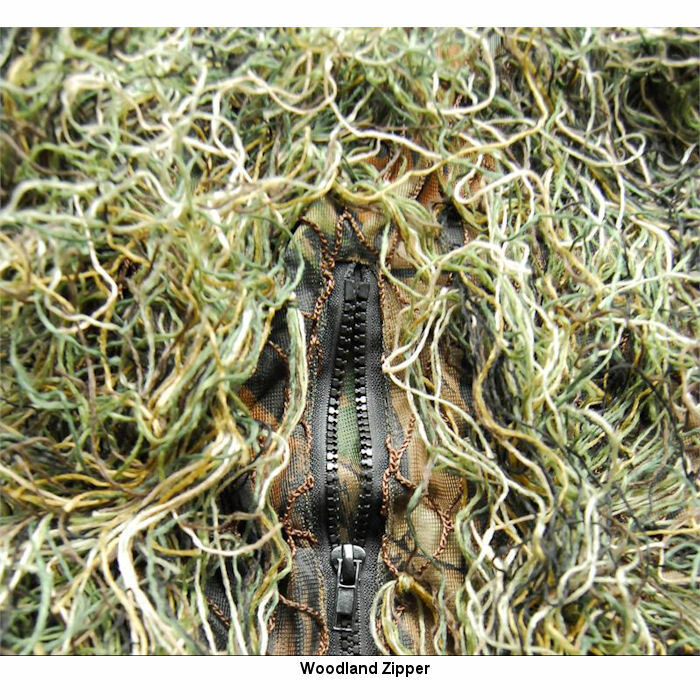 The optional matching synthetic rifle wrap is a a 5″ x 6′ nylon netting with 1″x 1″ Squares. It is long enough to cover any firearm. You can buy it separately for $19.95 or add it on as an option for only $15. Each complete suit comes in two (2) different patterns, and three (3) sizes. SIZES – Each size runs a little larger, and longer. There are cord locks on the sleeves and cuff of the pants keep them secure for shorter individuals. 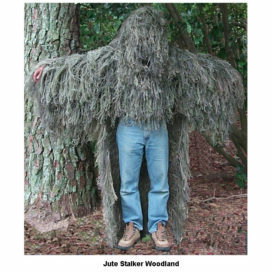 My son and I both took turns wearing it and did some hiding routines to see how invisible we were, worked great for my timber. I do a lot of still hunting and feel confident in wearing it. Hello, It is good to go with a little lighter pattern like mossy and then you can make it darker if needed by adding vegetation. If you were to order this suit in an XL, would the jacket fit like an XL t-shirt? Hello, The suit is built larger than normal with cord locks at the wrist and ankles. If you stay withing the sizing chart you will still have enough room to wear clothing underneath. The Woodsman is a very nice suit. The hand sewn strings are exactly the color I was looking for. 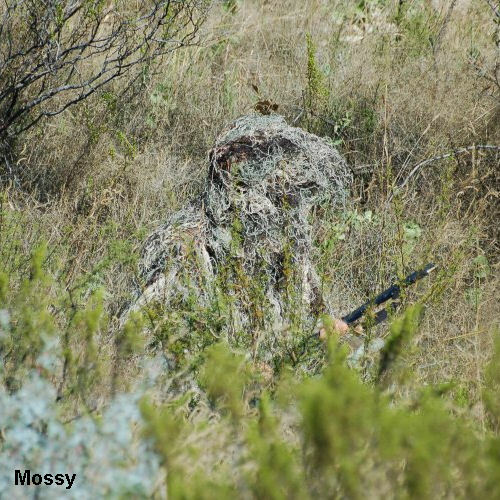 The mossy color appears to be great for the natural foliage that grows in Texas, but my concern was that some of the strings appeared to be loose in some areas. Some strings fell off and that may be a normal occurrence when the suit is brand new. I have not used it yet, but if the suit picks up natural foliage as it’s worn then this will not be a problem unless more loose strings continue to fall out. Nevertheless, I am very glad that I bought this suit. will it fit a 4-5x guy ? Hello, The sizing goes by waist size so the largest size will fit up to a 50″ waist and up to 7′ tall. Suit was shipped very quickly, and it’s way above what I expected even after reading the other good reviews. I’m 6’3 240# so I went with the extra large, and I couldn’t be happier. Can’t wait for Sept. to get here… with the mosquito netting in the hood, I fear no skeeter, and the deer will not worry about another hump of vegetation on the ground till the Kodabow lets one loose. Excellent product at a great price! Thank you! 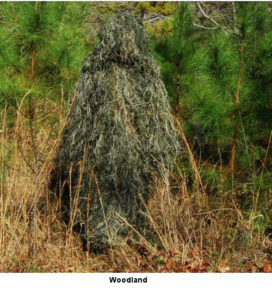 Love the Woodsman Ghillie suit! Especially the option to unzip the mosquito net face shield. Gets a bit hot sometimes with the face shield up. Excellent pattern/color placement. The rifle cover is a must. Service was fast when ordered with 2nd teir shipping. This is my 2nd suit ordered. The first was a present for a friend that after seeing I didn’t want to give away. This ghillie suit lives up to most of my expectations. The coverage is absolute. There are no bald spots. 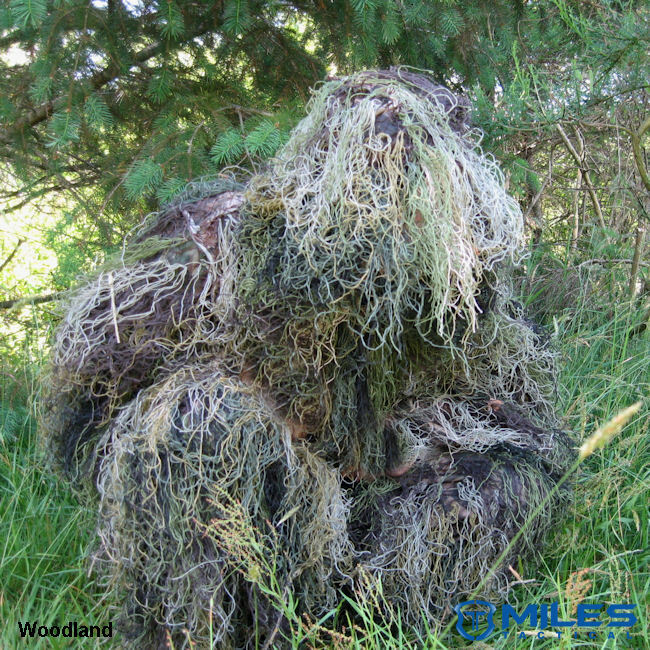 There is also plenty of room to tie on more ghillie string to lighten, darken or color the suit to better fit your particular environment. 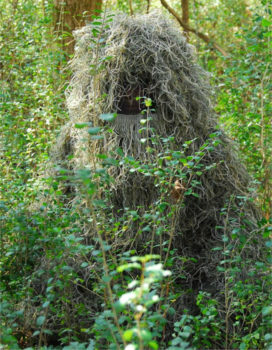 Roll around in some leaves and grass to get them into the suit and no one can see you.Pros:~ Breathable material~ Zippered pockets on the jacket and pants~ Drawstring pant legs and waist~ Removable mosquito net face cover~ Can add more string to customize~ If you get the rifle wrap there’s more than enough material to completely wrap the rifle twice over.Cons:~ Even though it’s breathable it’s quite warm. If you live in a hot environment don’t expect to be able to use this in the summer comfortably. When a strong gust of wind comes and you feel it go through the suit it feels great but until that happens it’s hot.~ You can’t see anything using the mosquito face cover at night so it must be removed. Prepare to be bitten.~ The lock on the drawstrings, especially on the waist, are quite weak. You can tighten them and the drawstring will still slowly pull through. The elastic waistband does 90% of keeping your pants up.I’m 6’4 200 pounds and the large fits well. The sleeves and jacket length could be a few inches longer. The pants fit good. 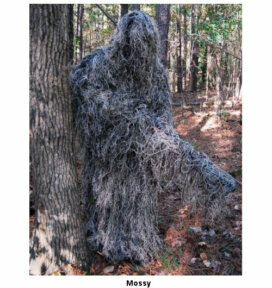 Without the ghillie string the pants might appear too short but with the string you have full boot coverage and are still stepping on ghillie string when you walk. If I could have I would have gotten an XL jacket with Large pants but apparently that’s not possible. I would highly recommend this suit. 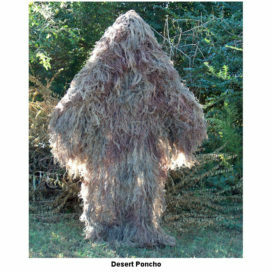 This is a great ghille for the price range. All the synthetic jute is hand tied which adds tons of durability which is a must if you actually plan on using it as designed. The face mask and pockets are an added bonus even though they can be hard to find in the fibers. Overall great product. Exactly what our grandson wanted for xmas! Well made, fit perfect. Exactly as advertised. This suit is great and my husband was so excited to get it for his birthday. 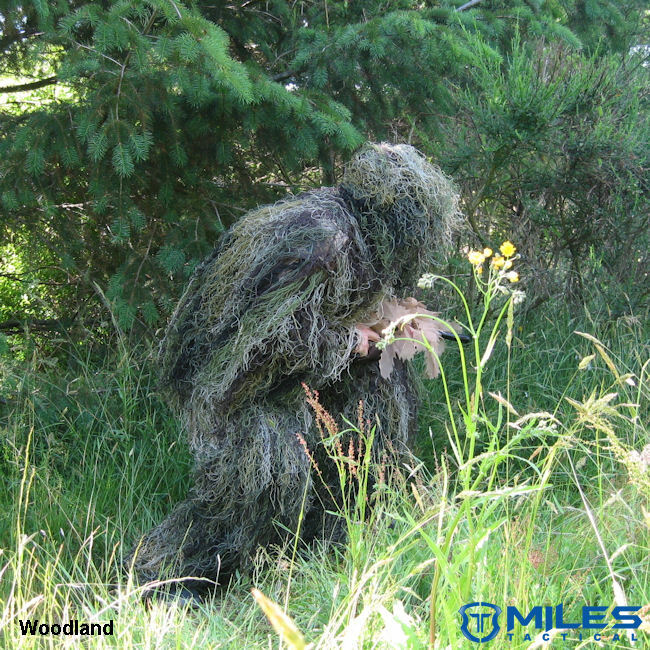 He blended right into the forest and is looking forward to getting a big trophy deer this season while wearing it! It arrived very quickly so thank you for that. Great product and great service. Ordering from your company could not be any easier. Suit shipped fast! I am happy with everything about my purchase! I am in receipt of my order and could not be happier at this time. I have not had the opportunity to hunt with the suit at this time, but hope to do so shortly.My initial impression is that the suit is well made, light weight, and can easier be modify (brushed in). I’m but sure it’ll meet my bow hunting needs, which was the purpose for my initial purchase, but I’m still exited for the promise of both gun hunting in a few weeks as well a turkey hunting next spring. I’m sure I’ll have further feedback as I get the opportunity to use the suit.Thank you again for what seems to be a great product with promise of good utility in the future. yes, i love the service and the suit is exceptional. yall will be my go to place.. thank you very much..i cant say enough about the service, i emailed several times and was promptly answered . the suit is very much better than the description implies. the face no-see-um with zipper tucked below the face cover flap is perfect. very, very comfortable, warm yet breathable. perfect for fall / winter hunting seasons. i can find absolutely no faults with the suit, it is just exactly what i hoped for and more. highest recommendation. This Suit is excellent. Very light weight, easy to move in. Great camo! Aside from building one your self from scratch, you cant buy a better suit. I received my order right on time and the product is excellent. The sizing of the suit is perfect and the quality is great. Can’t wait to put it to use hunting. 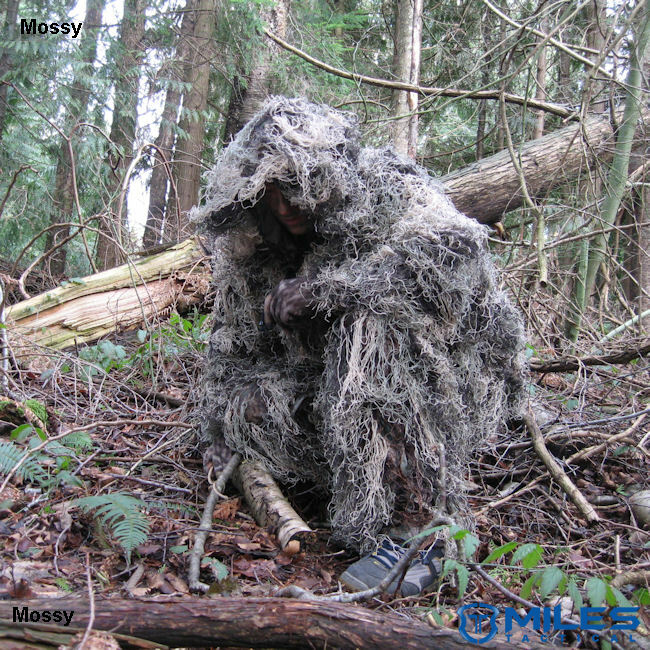 My son loves the Ghillie Suit. Thank you for recommending the better model. He is thrilled with the lighter weight and more realistic pattern. Fast shipping, amazing quality. Amazing colors and the fabric stays in place. 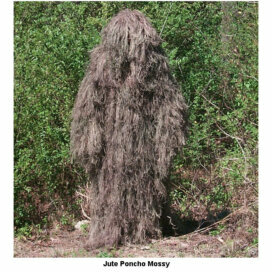 I have been looking at this Ghillie Suit for a long time, probably one of the best buys i’ve ever made. Thank you so much! I recommend this to everyone. Super fast shipping to Alaska!!! Got it within a few days, looks and fits super well!!! I received the suit about 3 business days after the order or pretty close. I am satisfied. Thank you! Quality of suit good but colors bad. Green colors extremely blue. All colors too bright. Need to dull the colors. My son says the suit is a BEAST and that means awesome according to the teenage language. Everything was oerfect and with no surprises at all. Everything was BEAST!!!!!! Great purchase! My boyfriend was stunned at christmas that I could pick out something so great 🙂 thank you for the superb product and service. Bought the suit for my 14 yr old grandson. He absolutely loves it. Liked it so much he bought one for his grandfather for Christmas. They are avid hunters and will get a lot of good out of the suits. I’m not a hunter, but was very impressed with the fabric. Not plastic like some of the other suits I considered. Will update this review after my grandson has hunted with the suit. Purchased for a present but I’m sure it’s great. thank you :)have recommended your site already.Australia be mindful may be a delay in delivery due to customs but no ones to blame. Thanks again hope to be back soon. very nice ,quick shipping used it squirrel hunting. While sitting on a bucket a wren landed on my shoulder. 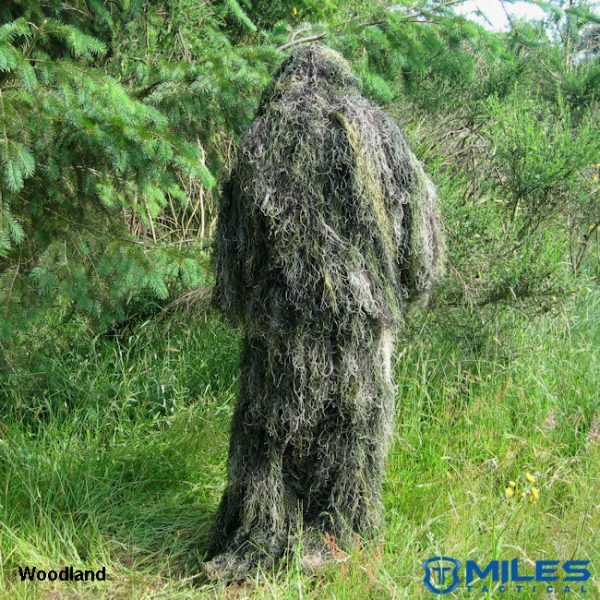 excellent ghillie suit and fast shipping. great material and fantastic coverage. 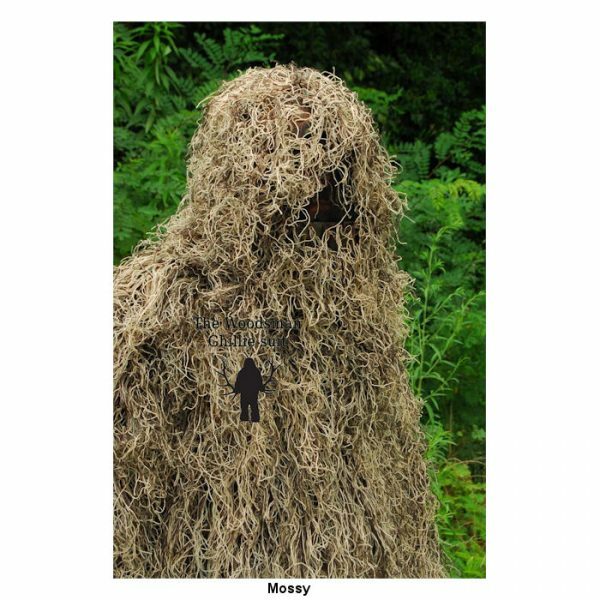 one flaw is that the fabric seams near the groin are somewhat weak, do not let this discourage you from purchasing this Ghillie suit, you can aviod tearing by sewing a single strand of thread over the others. 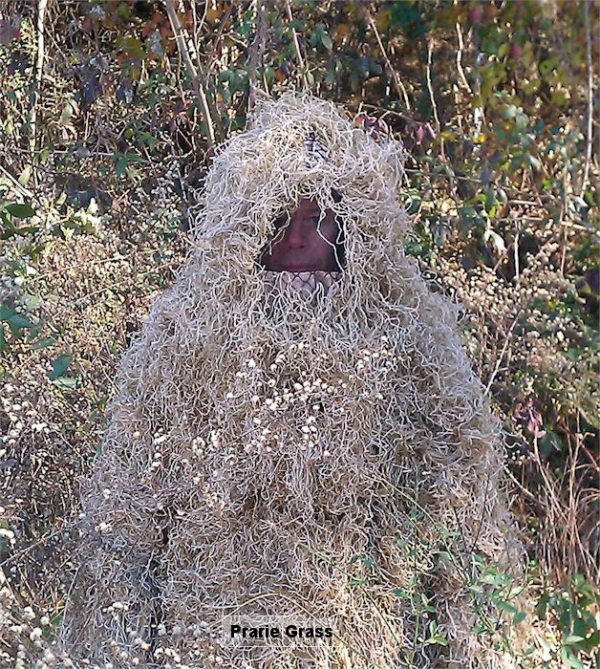 Overall wonderful Ghillie!! It is a gift for my grandson and he loved it. It arrived on time and I am very satisfied with the response and the product from your company. Very nice light weight odorless good colors for blending. Arrived quickly. Sales person was very nice. Probably will order another due to girlfriend hunts and liked mine. Great Suit – purchased woodland, coloring is fantastic. Quality materials, odor-less…. recommend to anyone considering. Service was great with excellent communication & fast shipping. The shipping was very fast. 2 Days. I am very pleased with the quality of this suit. Very well crafted and the color is outstanding. I have already used it on a fox hunt and the results were very promising. This suit is great!!! Thanks very much and I look forward to doing business in the future. Thanks Again. The suit is fine, very good quality.The service was excellent, the item was shipped next day.It arrived just a few days afterwards. (Greece-Europe).I would definately recommend these people to friends.Thank you once more. the suit is fine and the service is way above average. thanks again. 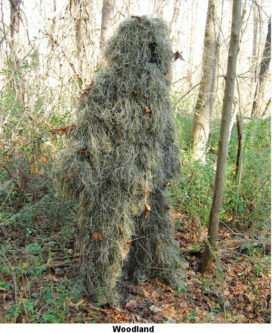 I orderd this ghillie suit from you guys a few days ago, I just received it today. Just wanted to say thank you very much, I was hightly impressed with the quality of the suit, the speed of delivery as well as the service!You guys did a great job! Hello, I was wondering what the best camo pattern for Austin Texas would be more specifically Paintball Texas’s You can look at their field and decide what would be best for it cheers! The pattern there will change with the season. You should stick to an Ultralight Mossy pattern and you can add vegetation to lighten or darken depending on the foliage!